Ben Yu isn't known as a no-limit hold'em guy, but that doesn't mean that he can't compete with the best. 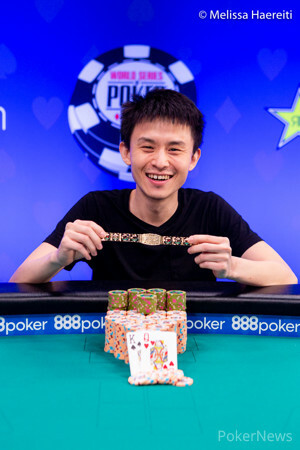 After two long days of play, Yu conquered a field of 128 players to take down his third World Series of Poker bracelet, his first in a no-limit hold'em event, and the first-place prize of $1,650,773 in Event #77: $50,000 No-Limit Hold'em High Roller. "I don't think I'm one of the top 10 or maybe even 20 players in this hundred person field," Yu said. "I was mostly just playing mixed games and the last year or two I've really started to work harder on trying to better myself because I really just want to get in there and battle amongst the best. I play all the different mixed games. I play Magic The Gathering competitively. It's going to be really hard for me to compete with some of these guys on and be the best. I'm pretty happy just to be able to compete at the highest level and have a shot to win a race against these guys." But Yu's hard work seems to be paying off, as he not only has put in good results in these high roller fields but results in multiple other no-limit hold'em events this year. Over the course of the year so far, Yu put together cashes in five different no-limit hold'em events including the Main Event (57th for $57,010) and Event #73: $1,000 DOUBLE STACK No-Limit Hold'em (fourth for $63,327), scoring for over $100,000 before this. "This is pretty unreal," Yu said about his victory. "I mean a couple days ago I was in Day 5 of the Main Event. I just busted and I wasn't that bummed compared to a lot of people being bummed out of the Main Event. I did make a final table in the 1K and got fourth place there. And I mean I thought that would be my best chance at that bracelet again this summer. I've had a really good summer. I've run really well, been very fortunate. So I just thought you know summer is about to be over. Pretty content with it. And this is just like the super special golden cherry on top of everything." According to Yu, he's been doing a lot of work on his game, training with another player who's at the top of his game right now, Justin Bonomo. "I actually wrote a message to Justin Bonomo," Yu said. "And I wrote 'I like playing high rollers. I cash for more money and people irrationally think I'm better at poker because of it. I get to eat free good food using comps. I would like to do this more often and I'm willing to put in whatever work is required for me to do so.' And he told me to study more PIO solver and it sounds really boring like this is what it takes to win at the high rollers nowadays for the most part." Yu said he doesn't have the poker instincts that some of the others do, so he wanted to invest more time into training something that he could improve: his brain. 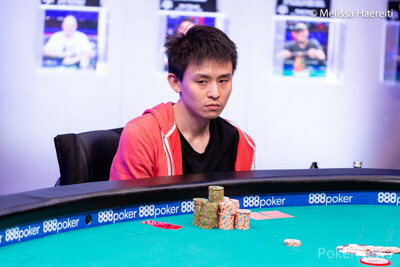 "I don't think I have the best poker instincts that some of the absolute sickos do," Yu said. "And I really just need to get by on studying and knowing exactly what my hand ranges should be in every spot. And I think a lot of people think that... that isn't the reason like most people get to poker when they first watched on TV. They really want to, you know, soul-read people and, you know, be able to feel themselves out the table. There's something really attractive about, you know, just trying to get a read on someone and feeling your way through a problem. But I think for the most part you see the guys that compete in this field, the people that are most successful and the people that win, time after time in these high rollers, and show up time after time, it's really the guys doing what we call science and studying." There were 31 players to start the day with players dropping quickly. Among those who didn't make it into the money were Byron Kaverman, Juan Pardo Dominguez, Sam Soverel, Daniel Negreanu, Taylor Black, and Scott Seiver. Seiver was the unfortunate bubble boy of the tournament. In his final hand, Seiver shoved ace-ten into Manig Loeser's ace-jack and failed to catch up. 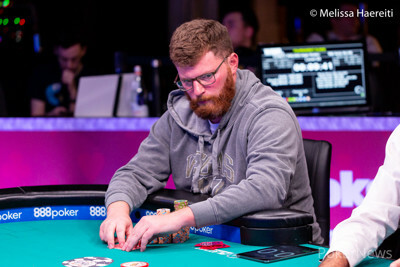 Among those to make the money, but not much further, were Ognjen Sekularac (20th for $74,623), Stefan Schillhabel (17th for $74,623), Chris Hunichen (16th for $84,073), and start-of-day chip leader Matthias Eibinger (14th for $97,160). Eibinger dropped after Jake Schindler caught a set of sixes on a ten-high flop against his aces and busted from the tournament just a few hands later. 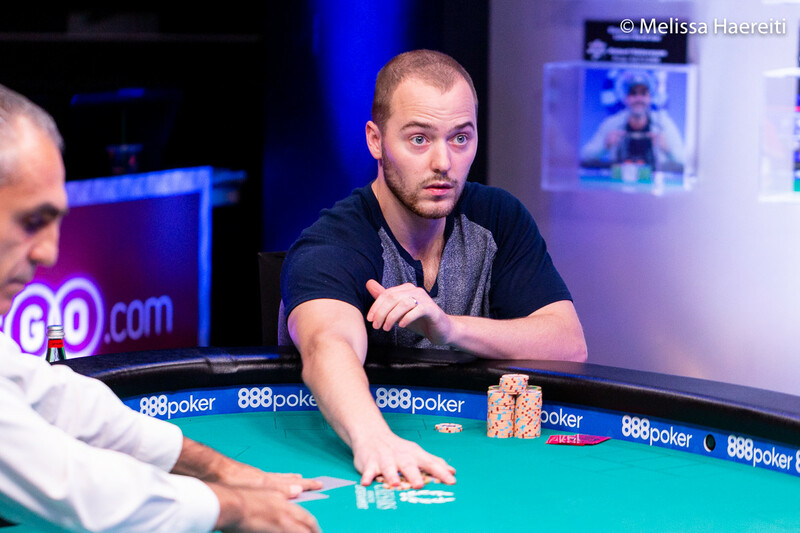 Mustapha Kanit and Ryan Reiss were both eliminated shortly after, collecting $97,160 and $115,102, respectively. 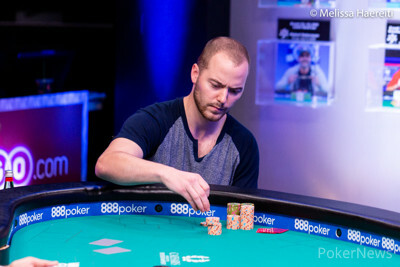 Jason Koon and Benjamin Pollak were the last two eliminated before the final table. Koon dropped to Yu when Yu went runner flush against Koon's flopped trips, a pot that would carry Yu through to the final table and to his eventual victory. Yu sent Pollak out the door shortly after. Yu shoved from the small blind with jack-five and Pollak was in the big blind with pocket eights. Yu caught a jack on the flop and that would spell the end for Pollak. Once the final table was reached, players once again started falling quickly, with the first four players falling within 25 hands, but the first to go at the final table was Elio Fox who was eliminated in ninth place. Fox shoved pocket sixes and was called quickly by Sean Winter who was in the big blind with pocket jacks. He didn't catch up and brought the table down to the official final table of eight. On the second hand of the final table, Jake Schindler was eliminated by Isaac Haxton. A short-stacked Schindler raised most of his chips with ace-five and Haxton was in the big blind with three-four suited. He put Schindler all in, then caught the only pair on the board to send him packing. Next to go was John Racener who was also eliminated by Haxton. Racener shoved on the button with king-jack but was called by Haxton's ace-three from the small blind. The board ran out queen high with Haxton making a pair of threes to send Racener in the rail. 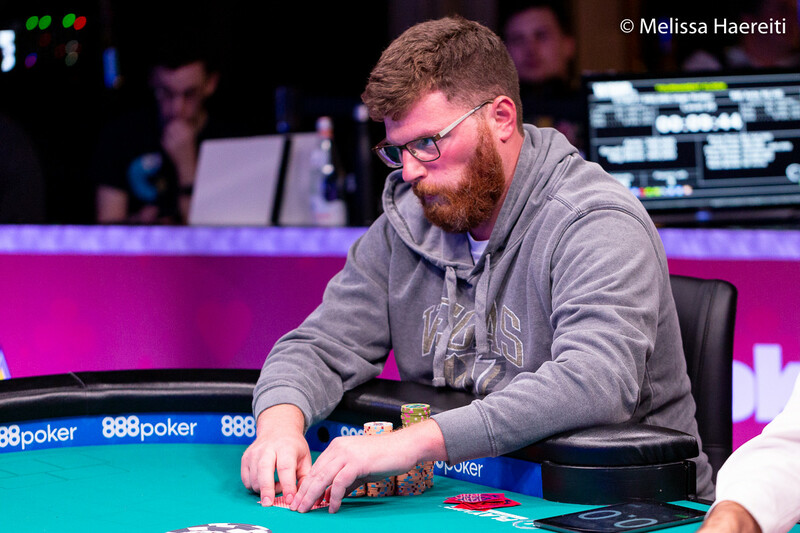 Manig Loeser would fall in sixth place just a few hands later, after limp-calling off from the small blind with ace-king suited when Sean Winter shoved from the big blind with pocket threes. Winter's threes held up as the best hand to send Loeser to the rail. Igor Kurganov dropped in fifth place when his ace-queen lost a race to Winter's pocket sixes as well. Yu stayed quiet for a majority of the final table. He came into it with the chip lead and hung one to most of his chips until the final four. Play continued a bit slower for the next 25 hands or so until Haxton shoved all in over Yu's cutoff open and Yu snap-called with ace-queen. Haxton was holding ace-seven and was unable to catch up to stay alive and was eliminated from the tournament in fourth place. Yu then doubled through Winter in a dominating situation when Yu held pocket nines against Winters ace-eight all in preflop. Yu held on to double back over 10 million and it marked a turning point of sorts for the match. Just two hands later, Yu Eliminated Nick Petrangelo when his pocket fours held up against Petrangelo's ace-ten. That gave him a lead heading into heads-up play of just about 5 million chips. The heads-up match only lasted two hands because, on the second hand of play, the two got all the money in with Yu holding king-queen and Winter holding ace-nine. Yu turned a king, marking the end of the match as Winter didn't catch up on the river. 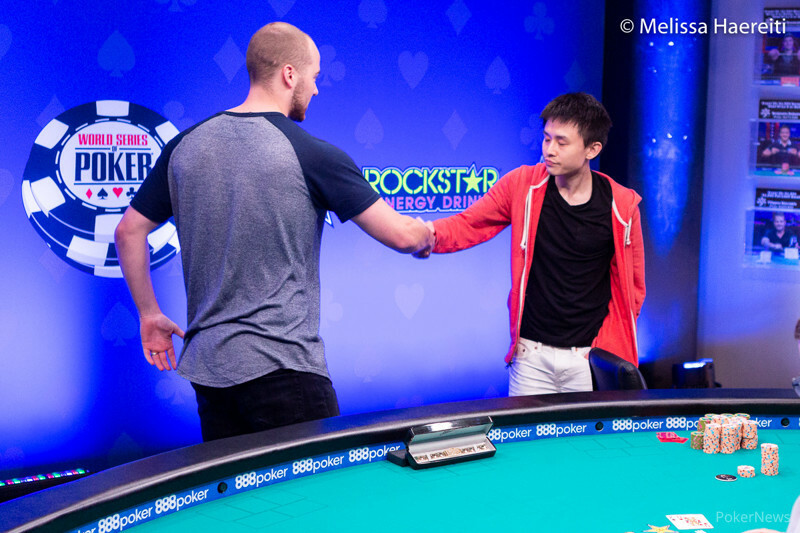 With that, Yu took down the first-place prize of $1,650,773 and his third bracelet. Despite winning over a million, Yu said that he doesn't see himself competing in Sunday's $1,000,000 buy-in. "I think that's too much for me," Yu said laughing. "I do set my plans ahead of time. I don't react to just having a big score and then jumping to the next one. And I didn't plan to play One Drop and I'm not going to play it. Maybe a couple years after some more improvement." PokerNews will be there for the $1,000,000 buy-in which starts at 3 p.m., though, so make sure to check back in for all the action. Hand #98: Sean Winter limped in the small blind and Yu moved all in. Winter called. The flop came with Winter still in the lead. The turn was the , giving Yu a pair. "Congrats," said Winter to Yu before the river was dealt and Yu won the pot. "I'm sure we have many battles ahead," Yu said, shaking his opponent's hand before running hands raised to his rail in celebration. Winter takes home $1,020,253 in prize money for his second-place finish. Hand #97: Ben Yu raised to 1,000,000 and Sean Winter called in the big blind. The flop came and Winter check-folded to a bet of 800,000. Hand #95: Nick Petrangelo shoved from the small blind and Sean Winter folded in the big. Hand #96: Petrangelo opened to 800,000 on the button and Ben Yu shoved in the big blind. Petrangelo made the call to put himself at risk. The board ran out and Petrangelo was eliminated in third place. The final two players have been sent on a short break. Hand #90: Nick Petrangelo moved all in from the button and took down the pot. Hand #91: Sean Winter moved all in from the button. Ben Yu called from the small blind and Petrangelo folded his big blind. The flop gave Yu a set and the board ran out and Yu doubled up for 4,375,000. Hand #92: Yu moved all in from the button and took down the pot. Hand #93: Winter limped in the small blind Yu raised to 1,000,000 and took down the pot. Hand #94: Petrangelo received a walk in the big blind. Hand #85: Sean Winter opened with a raise to 800,000 and it was enough to get through the blinds allowing him to take down the pot. Hand #86: Nick Petrangelo limped in from the small blind and Sean Winter checked his option from the big blind. The flop was and Petrangelo bet 400,000. That was enough to get through and he took down the pot. Hand #87: Nick Petrangelo shoved all in on the button for 8,700,000 and both blinds folded, allowing him to take down the pot. Hand #88: Nick Petrangelo received a walk in the big blind. Hand #89: Nick Petrangelo limped in from the small blind and Sean Winter checked from the big blind. The flop was and Petrangelo checked. Winter checked as well. On the turn, Petrangelo checked again. Winter put out a bet of 800,000. Petrangelo called. The river was the and Petrangelo checked again. Winter bet 2,800,000. Petrangelo called but mucked when Winter showed down his for a rivered full house. Hand #80 : Nick Petrangelo shoved from the small blind and Sean Winter put himself at risk in the big blind. The board ran out and Winter doubled up. Hand #81: Winter opened to 1,200,000 from the small blind and Ben Yu folded the big. Hand #82: Winter shoved on the button and won the pot. Hand #83: Yu shoved on the button and collected the blinds and antes. Hand #84: Winter limped in the small blind and Yu checked his option. A flop was dealt and Winter bet 400,000. Yu made the call and the two saw the hit the turn. Winter fired 1,600,000 and Yu called once more. The landed on the river and WInter slowed down, checking to Yu. Yu checked as well and mucked when Winter tabled the . Hand #75: Sean Winter moved all in for around five million from the small blind and took down the pot. Hand #76: Ben Yu moved all in from the small blind and took down the pot. Hand #77: Nick Petrangelo limped in the small blind and Winter moved all in from the big blind. Petrangelo folded. Hand #78: Petrangelo raised to 800,000 and took down the pot. Hand #79: Yu limped in the small blind and Petrangelo moved all in. Yu folded.